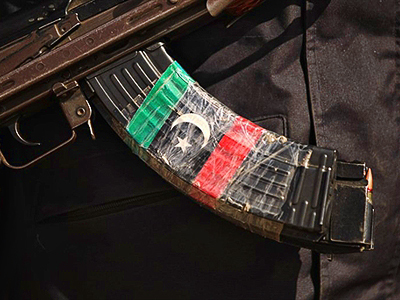 The Libyan government’s spokesperson Ibrahim Moussa said that he is optimistic about a political solution to the current Libyan crisis. ­He said that the government was open to holding a referendum and holding elections to reform the whole political system, and that all this needs to be done with the leader Muammar Gaddafi at the helm. Moussa said that Gaddafi is needed to move the process forward. He also says that the international community has no right to say whether or not Gaddafi must stay or leave. Tripoli has always said that any kind of western intervention would be nothing but immoral and illegal. Libya’s deputy Foreign Minister Abdelati Obeidi has been in the Turkish capital of Ankara holding talks, so reportedly there is a deal on the table that would possibly involve the two sons of Gaddafi overseeing a transition to a constitutional democracy, but no confirmation of this is known per se. 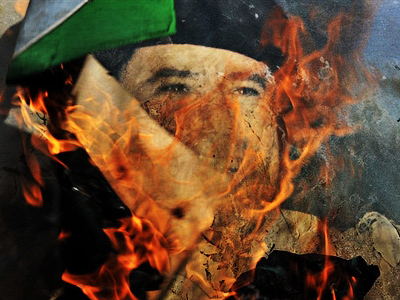 The problem is the Libyan opposition as well as many in the international community will simply not accept a settlement deal that would see Muammar Gaddafi or members of his family involved in the leadership of the country. After France and Qatar, now it became Italy’s turn to officially recognize the opposition in Benghazi as the legitimate voice of Libya. Tripoli could only regret this decision. The British have gone further, saying that should any members of Gaddafi’s government enter the UK and publicly denounce their loyalty to Muammar Gaddafi – Britain would lift travel bans against them. The US has now withdrawn from frontline operations in Libya and is currently providing logistical and intelligence support. This is widely understood as an attempt to get other NATO nations to increase their contribution to the no-flight zone over Libya. British PM David Cameron has said that he is deploying more Tornado fighter jets to the region. He also said that the Libyan leader is under great stress and looking for a way out of this whole situation. 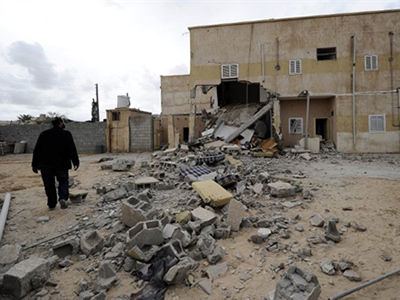 Libya clashes and coalition strikes. Click to enlarge. 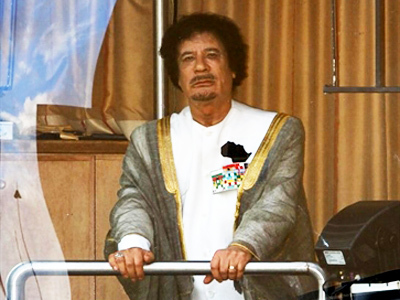 Libyan state television has been showing pictures of Gaddafi outside of his compound saluting his supporters, but there is no way to independently verify exactly when these photographs were taken. But certainly there is a sense of increasing frustration in Tripoli, where shortages of fuel and large queues outside shops where people are trying to buy the basic food items, make people begin to speak about the possible downfall of Gaddafi regime. 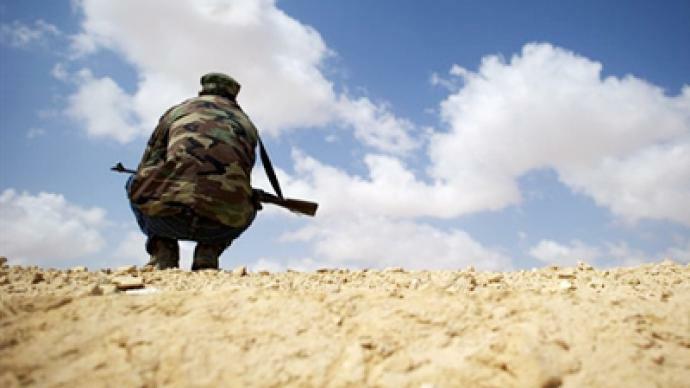 The fighting on the ground is still located around the same two eastern towns of Brega and Misrata. There have been no NATO air strikes in Brega for the last 24 hours, but on Tuesday NATO did hit a convoy of eight Gaddafi military vehicles, which were advancing from the center of the town to the outskirts, controlled by the rebels, reports RT’s Paula Slier. Eyewitnesses say two of the vehicles were hit, and the convoy retreated back to the center, which is under their control. The town is of strategic importance to the rebels, as there is a small oil refinery there. If they could maintain control over it, it will be a source of income for the rebels, who could then purchase some heavy weaponry. So far, this still remains an issue and the rebels have continued calling on the international community for a weapon supply. In Misrata, Monday afternoon, air strikes resumed after a 36-hour break. Reports say five people have been killed and twenty four wounded. There is an impending humanitarian crisis in Misrata, where residents say there is no electricity, food, water or fuel. 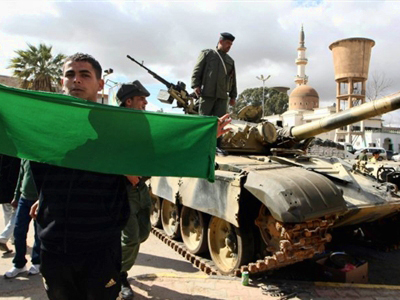 People there remain trapped amidst the fighting and clashes of pro and contra Gaddafi forces.